First edition was 2000-07-28 according to Amazon.com as of 2012-09-16. Fourth printing per the numberline that is found on the book's copyright page. No price is to be found anywhere on or in this book. Price was $82.00 in a college bookstore. Contents of this anthology is broken down into several parts. Section One: Two Archetypal Stories (p 5-28). Section Two A: Fantasy: Dark Fantasy (p 29-206). Section Two B: Fantasy: High Fantasy (p 207-340). 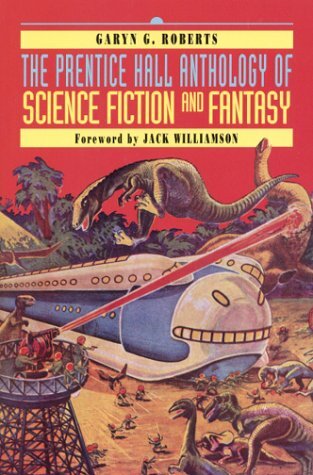 Section Three: Science Fiction (p 341-1123). Section Four: An Historical Perspective (p 1125-1134). Section Five: Lists and Bibliographies (p 1135-1174). Each story is preceded by two to four paragraphs that are biographies of the authors of the story and why it is included in this volume. Page numbers on the contents page represent when the notes start and not necessarily when the story starts in the anthology. All stories are printed in chronological order in each section. Many stories on the contents page are preceded either or both a television or movie projector icon to show if that story has been adapted into the visual medium. Editor Roberts mistakenly attributes the first printing of Jack Finney's story "The Third Level" to the October 1952 issue of The Magazine of Fantasy and Science Fiction. Editor Roberts edites Clark Ashton Smith's previously published short stories "The City of the Singing Flame" and "Beyond the Singing Flame" into one story. Each story's publishing history is listed separately on this site. There is a four page glossy insert that reproduces four classic and archtypical pulp covers by Margaret Brundage, Edd Cartier, Frank R. Paul and Howard V. Brown. 864 • Harrison Bergeron • (1961) • short story by Kurt Vonnegut, Jr.
915 • The Last Flight of Dr. Ain • (1969) • short story by James Tiptree, Jr.